UPDATE 19:25, 23 Sept: Many, many thanks to our Israeli activist friends who have given so much of their time and energy to help us! We would not be able to navigate the legal system as smoothly as possible without their support. British citizens Gordon Bennett, 44, Ellie Clayton, 24 and Aimee McGovern, 23, and American citizen Lauren Siebert were released from Ariel settlement police station today, are now under house arrest in Tel Aviv for the next 7 days. The authorities are withholding their passports, and it is possible that at the end of the week the activists will be handed over to the Ministry of Interior for deportation. The tactic of arresting pro-Palestinian activists in order to directly deport them is illegal by Israeli law, but is a tactic often used by the Israeli army to suppress solidarity efforts. The Israeli activists have given the internationals a place to stay under house arrest, as well as transportation from Ariel. ISM is working to figure out the status of the Majed Faruq and Abd al-Latif Faruq, two Palestinians who were also arrested Friday. Four human rights defenders (3 British citizens and an American), as well as two Palestinians, were arrested at the weekly Kufr Qaddoum demonstration. They are currently detained in the illegal Kedumim settlement police station for interrogation. The two Palestinians, Majed Faruq, 20, and Abd al-Latif Faruq, 24 were arrested from inside their homes as the army stormed the village. Soldiers chasing a group of international human rights defenders shortly before arresting 4, still being held in police custody. (Photo courtesy of The Kufr Qaddum demonstration). 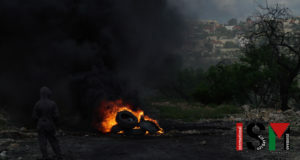 The villagers of Kufr Qaddoum demonstrate weekly against the closure of the road from their village to Nablus since 2002. The Palestinians are not allowed to travel the most direct route to Nablus, 13 km away, due to the positioning of nearby illegal Israeli settlement Kedumim. The commute to Nablus from Kufr Qaddoum is now doubled. Although the weekly Kufr Qaddoum demonstrations have been going on for over a year, the Israeli military has recently upped efforts to stop the demonstration from occurring. 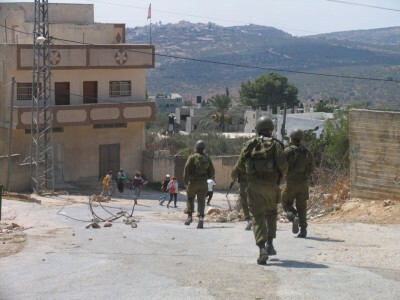 In the past two weeks, the soldiers have entered the village before the midday prayer and the beginning of the march towards the closed road, surrounding the mosque and firing tear gas into the crowd. Three people, including an Israeli press activist, were injured as tear gas canisters were shot directly at them, hitting them in the arms. In addition to tear gas and sound bombs, after the arrests the Israeli military entered into the village with a skunk water truck. 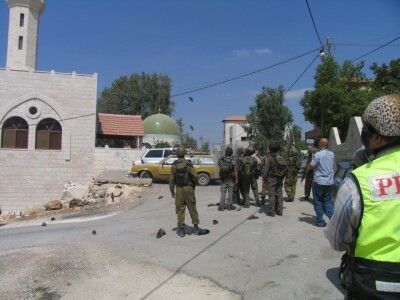 The checkpoints around the village were closed by the Israeli military until 5 p.m.
Resident of the Palestinian village throwing shoes at the soldiers after they entered the village and began shooting teargas near the mosque during Friday prayers. (Photo courtesy of The Kufr Qaddum Demonstration). The Israeli military has been continuing their arrests of villagers: soldiers came early yesterday morning, Thursday 20 September at 2:30 a.m. to arrest four young Palestinian men: Taka Mohammad, 17, Mohammad Amir, 16, Yosouf Shtaiwi, 20, and Nadir Amer, 23. Anas Waleed Barham, 22, was arrested early Wednesday morning at a checkpoint. Another resident of Kufr Qaddum, Ahmad Shtaiwi, 22, remains in prison since his arrest March 16th. The nonviolent human rights defenders have been charged with throwing stones and being in a closed military zone. There are reports that the detainees were beaten during the arrest, although this remains unconfirmed. Eva Smith is a volunteer with the International Solidarity Movement (name has been changed).